As much as I love Paris, from time to time I find myself longing for a little reminder of the US. There are some days when I’d just rather have a bagel and drip coffee than a baguette and espresso, or reach for a jar of Kiehl’s moisturizer, instead of something fancy from a French pharmacy. French journalist and author Noélie Viallet has scoured the city to find everything from the best cheesecake and donuts, to the latest in fashion and beauty from the good ole US of A. This all-in-one guide features fabulous photography and graphics, alongside 200 ideas and addresses for food, shopping, personal care, culture and more in Paris… all à l’américaine! 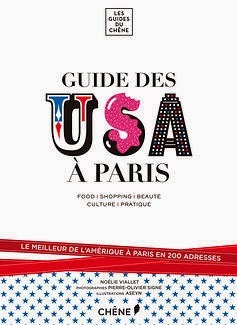 Le Guide des USA à Paris is available in French, and sold in France, Belgium, Francophone Canada and online.